Sports medicine is a branch of medicine evolved in late 20th century.It deals with the treatment of musculo-skeletal sports injuries. It not only deals with the sports injuries but it also focusses on the physical fitness and well-being of sportively active people.This branch of medicine is involved in the treatment and prevention of the injuries that could be caused due to sports or exercises.Sports injuries can occur during any sport either indoor or outdoor. It can also happen in people who are not involved in sports. Some of the injuries caused by accidents are also treated using sports medicine. Who should consider sports medicine? 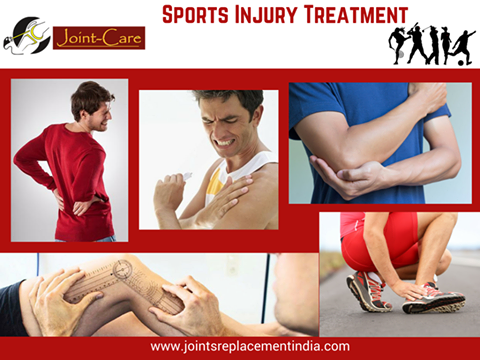 People suffering from sport injuries such as sprains or dislocation are the first candidates for the sports medicine. Strains and fractures caused during any sports ,or falling or accidents can also be treated by this method.Some of the other common sport injuries that affects the joints or any post traumatic arthritis cases are all the candidates for sports medicine. The common knee injury that can be seen in athletes is an ACL tear , which is caused by the hyper- extension of the knee than the normal limits. Some of them are caused while landing from a jump or tackling a football.These tears or injuries are commonly associated with sports people who play games such as rugby, football , wrestling and martial arts. Traumatic injury which can cause meniscal cartilage tear is another indication for which the sports medicine is used. Shoulder joint injuries such as rotator cuff injuries can all be treated . How to diagnose sports associated injuries? To diagnose sports associated injuries , a physician performs physical examination of the affected region or joints such as knee, shoulder or ankle . The physician checks for the tenderness, swelling and range of motion of the joints. Further , X-rays of the joints are taken. Computed tomographic (CT) scan, or magnetic resonance image (MRI) are also be used for this purpose. MRI is the most suited option for the detection and analysis of the ACLtear. It can clearly detect the bruising of the bones in the knee, which is resulted from an ACL injury. MRI not only detects the ACL tear, but it can also detect the damage to the surrounding other three ligaments and cartilages or other meniscus injuries. What steps are taken to prevent the sports injury? Sports injuries can be prevented by taking some precautions such as wearing protective gear of the associated game such as eye gears, mouth and elbow guards ,pads and athletic shoes without fail during the practice as well as the gaming sessions to get protection from different injuries. Following the right exercise schedule without overdoing , having balanced healthy diet, keeping fitness and avoiding playing when not fit physically are some of the measures that are suggested to prevent sports injuries. How beneficial are the sports medicine treatments ? Some of the treatment the conservative methods such as the physical therapy, anti inflammatory medications, elevating the injured part while sitting or sleeping and icing the affected region. Exercises are the other methods considered to regain the motion and strengthen the muscles.As far as the athletes are concerned,arthroscopic surgical treatments are available for faster recovery from sports injury.